As a Cajun who is an avid fan of the Internet and does not speak Cajun French, I’ve looked around for a site to help me learn my parents’ native tongue. After an exhaustive search, I realized that such a feat cannot be accomplished online at this point. However! There are really great books available to help you learn. One of them has an accompanying CD which is great for listening at home, in your car or on your iPhone. These books authored by Rev. Daigle are considered the authority on teaching yourself Cajun French. 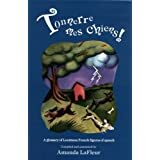 Amanda LaFleur’s Tonnerre mes chiens! is great follow-up book for learning Cajun figures of speech. Lafayette Native Rev. Daigle (1900-1998) spent thousands of hours compiling this book, true examples of his deep love and dedication to the Cajun culture and it’s people. Father Daigle himself narrates in English and pronounces in Cajun French the lessons from the book. Now in its seventh printing, the new revised edition is a must for every household of Cajun descent. It comprises a section of English to Cajun and one of Cajun to English.